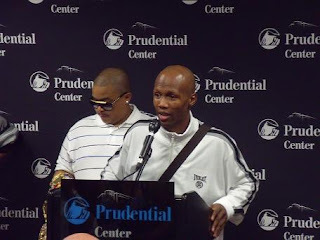 After a 9 month layoff, Zab "Super" Judah (39-6, 27 KO's) made a convincing statement in front of 4,215 fans at the Prudential Center in Newark, N.J., stopping Jose Armando Santa Cruz (28-5, 17 KO's) in the third round. The victory places Judah back in the mix with the top fighters of the junior welterweight division. Judah has now won three straight bouts and five of his last six, while Santa Cruz was kayoed for the fourth time in his professional career. Judah was euphoric following the fight. 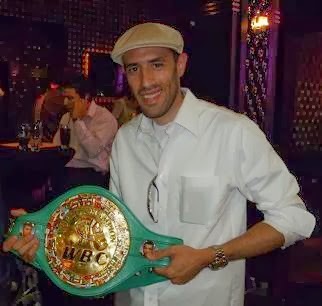 "They mention Timothy Bradley, Devon Alexander and Amir Khan; They are so-called champions," stated Judah. "Don't forget about me. I'm here and I'm coming back!" Judah is certainly back and credits his original promotional company, Main Events, with his resurgence. "I came back and got with a promotional company that I started my career with, the promotional company that made Zab Judah who he is," said Judah. "You're going to see a lot of us. We're not going nowhere." Judah's performance was exceptional, as his punches looked particularly sharp. He displayed a game plan and stuck to it. Judah's shots landed with pinpoint accuracy, and he kept Santa Cruz turning after he threw his combinations. In the first round, Judah connected with a series of straight lefts and right hooks to Santa Cruz' body. Santa Cruz had a great deal of trouble getting his shots off. Judah continued his superior lateral movement in round two, repeatedly turning Santa Cruz as soon as he finished landing straight lefts and right hooks to the body. Then, Judah opened up his arsenal a little more and connected with a straight left that landed flush on Santa Cruz' face. In round three, Judah sneered at Cruz for a brief moment. After that, Cruz stepped up his game and struck Judah with rights and lefts in succession. Next, Judah unleashed a vicious left uppercut that flattened Santa Cruz. Judah, who is known as a terrific finisher, blasted Santa Cruz when he got up with several lefts and rights until Benjy Esteves stopped the action at 2:33. "He got me with a really good uppercut," said Santa Cruz. "I got beat by a really good fighter." Clearly, Judah will fight anyone next. WBC and IBF titlist Devon Alexander, WBO titlist Timothy Bradley and WBA titlist Amir Khan top the list of possible upcoming opponents for Judah. Alexander, Bradley and Khan are all excellent, young fighters. However, none of them possess the experience or reputation of Judah. They are all untested and need a fight with Judah to prove themselves in the junior welterweight division. On the other hand, Judah needs them just as much, as his performance tonight indicates he is ready for a title shot right now. October 2nd at the Prudential Center is the tentative date and venue for Judah's next bout. "They're talking about them fighting each other," Main Events C.E.O. Kathy Duva stated, referring to the discussions by HBO about Alexander, Bradley and Khan fighting each other. Duva added, "We have a plan to fight on October 2nd, and if they would like to be here they are more than welcome." And if Mayweather and Pacquiao cannot agree to terms of a highly anticipated bout, Judah would be more than happy to fight Pacquiao. "You put 20 million on the table and 40% of that PPV, we'll do it," acknowledged Judah. Without a doubt, Judah's confidence is at a pinnacle right now. Judah declared, "This is just my opinion - I'm the best pound-for-pound fighter in boxing." Light heavyweight Angel Concepcion improved to (2-0, 0 KO's), capturing a 4 round unanimous decision victory against Shannon Anderson (4-2, 2 KO's). Official scores were 40-35 and 40-36 twice. In the first round, Concepcion utilized a stiff left jab to keep Anderson off balance. Anderson was looping his punches and got stunned by an overhand right. Concepcion battered Anderson some more in round two, landing consecutive left hook - right hand combinations. Just as the bell sounded to end the round, Anderson connected with a left hook to the head. However, Concepcion continued to assault Anderson in round three, wobbling him after landing consecutive left hooks to the head. In round four, Concepcion landed a solid left hook to the body. Anderson responded quickly, connecting with a right - left combination. Then, Concepcion answered with an overhand right. Throughout the entire bout, Concepcion landed the cleaner and more effective punches. In a cruiserweight brawl, Patrick Farrell (5-1-1, 3 KO's) and Newton Kidd (7-7-2, 4 KO's) fought a 6 round majority draw. Official scores were 57-56 for Kidd and 57-57 twice. In round one, Farrell was very aggressive, but Kidd struck him repeatedly with a stinging left jab. Kidd nailed Farrell with a right uppercut - left hook combination in round two, although Farrell answered swiftly, scoring with a big left hook to Kidd's head. Kidd showed more lateral movement than the previous round. In round three, both men fought at a furious pace. Farrell connected with a number of left hooks, while Kidd staggered him with several rights to the head. Toward the end of the round, Farrell's punches lost a little steam. Round four was close, as Farrell scored with a hard left hook and used his jab more. Next, Kidd caught Farrell with a left hook. After that, Kidd landed a left - right combination. Farrell opened round five by landing a sharp right to Kidd's stomach. Then, Kidd landed numerous rights to Farrell's head. Farrell was hurt, but would not go down. Farrell displayed a tremendous amount of courage, and fought back valiantly. Both men were exhausted by the end of the round. Farrell hurt Kidd in round six after he connected with a right to the head. Consequently, Farrell kept pressuring a tired Kidd, throwing right hands and left hooks to the body. Farrell kept banging away with body shots until the bell sounded. After exchanging knockdowns in the first round, unbeaten heavyweight prospect Adam Kownacki (4-0, 4 KO's) steamrolled Damon Clement (0-3) with a perfectly timed right hand that floored the Ohio native. Time of the stoppage was :42. Clement has been stopped in all of his professional bouts. Welterweight Alex Perez (12-0, 7 KO's) remained undefeated, scoring an 8 round unanimous decision over Edvan Barros (10-10-1, 7 KO's). Official scores were 77-75, 78-74 and 80-72. Throughout the fight, Perez connected with numerous right hooks and straight lefts, but Barros displayed a remarkable chin. At times, Barros landed some ferocious body punches, although Perez took the shots well. Barros pushed Perez to the ropes many times in the bout, hammering him with hard body shots. However, it was quite clear that Perez was scoring with extremely sharp counters, mostly to Barros' head. Sadam "World Kid" Ali (8-0, 4 KO's) put on his most spectacular performance to date, stopping Julius Edmonds (7-8, 0 KO's) in the third round of a welterweight bout. Ali's punches were exceptionally fluid from the opening bell, as he displayed vast improvement in his timing and placement of punches compared to his previous outings. Ali also exhibited quick left hooks and crisp inside punching that left Edmonds astounded. The volume of punches that Ali threw proved to be just too much for Edmonds to handle, as he dropped the Philadelphia fighter with a quick right hand in round one. As a result, Edmonds sustained swelling under his right eye, which led to a small cut opening seconds later. Ali went on to floor Edmonds with a fast left hook - left uppercut combination in round two. In round three, a devastating left hook by Ali badly hurt Edmonds. Then, Ali unloaded a barrage of punches with Edmonds' back against the ropes until referee Eddie Cotton halted the bout. Time of the stoppage was 1:14. In lightweight action, Nicky DeMarco (3-2, 2 KO's) avenged an earlier 4 round majority decision loss to Jose Guzman (5-8-1, 0 KO's), winning a 4 round unanimous decision by scores of 40-36 and 39-37 twice. Beginning in the first round, DeMarco swarmed Guzman with an onslaught of punches and prevented him from unloading his shots. DeMarco trapped Guzman on the ropes numerous times, scoring with a variety of short head and body shots. In round two, Guzman struck DeMarco with a solid left hook to the body. However, DeMarco kept coming at him with punches from all angles. Guzman's punches lacked the power to hurt DeMarco. During the third and fourth rounds, Guzman showed signs of fatigue. In contrast, DeMarco proved to be in superior condition, demonstrating plenty of energy in the second half of the bout.